The Heritage Center is in front of the Church in the ABC Building on the second floor. A lift is available for those with special needs. For arrangements for groups of 20 or more, call 922-3121. No admission fee, free-will offerings appreciated. Saint DamienServant of God and Servant of Humanity, is a remarkable model for our time.Joseph de Veuster was born in Tremelo, Belgium, on Jan. 3, 1840. He entered the novitiate of the Congregation of the Sacred Hearts of Jesus and Mary in Louvain in 1859, following in the footsteps of his older brother. He took the name Damien. In 1863, his brother, who was to leave for the Hawaiian Islands, became ill and Damien took his place. 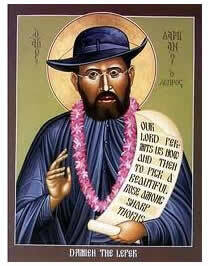 He arrived in Honolulu on March 19, 1864, and was ordained at the Cathedral of Our Lady of Peace on May 21, 1864. He first was sent to be a country missionary on the Island of Hawaii, but in 1873 responded to a request from Bishop Louis Maigret and volunteered to minister to the people of the Hawaiian Kingdom who were exiled to Kalaupapa on Moloka’i because they had leprosy, now known at Hansen’s Disease. For the remainder of his life, Damien was a fearless advocate for his people. In a letter to his brother, Pamphile, he wrote “…I make myself a leper with the lepers to gain all to Jesus Christ. Damien saw to both the spiritual needs and the temporal needs of the people of Kalaupapa. He dressed ulcers, built churches and homes and coffin. He organized schools and farms and saw to it that laws were enforced. In 1884 Damien contracted leprosy. He died on April 15, 1889, and was laid to rest next to St. Philomena Church in Kalawao among his beloved lepers. In 1936, his remains were returned to his native land at the request of the Belgian Government. He was declared Venerable by Pope Paul VI in 1977, beatified by Pope John Paul II in 1995 and canonized by Pope Benedict XVI in 2009. He served for 16 years in Kalaupapa, but his legacy as a hero of charity will serve as a model for generations to come. In 1883, the Kingdom of Hawaii put out a call for assistance to religious communities to open a hospital for leprosy patients on Oahu. Only Mother Marianne Cope, superior general of the Sisters of Saint Francis in Syracuse, N.Y., responded. “I am not afraid of any disease…,” she said. On Nov. 8, 1883, six sisters and Mother Marianne arrived in Honolulu on the SS Mariposa. In 1888, Mother Marianne responded again when the government asked for help in founding a home for women and girls in Kalaupapa. She arrived several months before Fr. Damien’s death and assured the dying priest she would also care for the patients at the Boys’ Home in Kalawao. After Damien’s death, she built a new boys’ home and on its completion, suggested that Brothers be invited to run it. When they arrived in 1893, she withdrew the Sisters working there to work with her at the Bishop Home. She died of natural causes on Aug.9, 1918, almost 35 years after arriving in Hawaii. 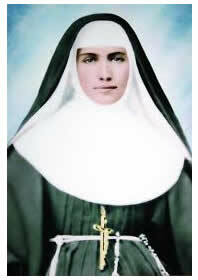 Mother Marianne, formerly Barbara Koob, was born on Jan. 23, 1838 in Germany. Her family emigrated to New York in 1839. She entered the Sisters of Saint Francis and was invested in 1862. She began her career as nurse administrator in 1870. She was known to be ahead of her time in the treatment of patients and sponsored programs or classes in connection with hospitals in Syracuse, Honolulu and Kalaupapa. At Kalaupapa, she fostered an interest in color harmony, needlework and landscaping. In 2004, Pope John Paul II declared her Venerable. Mother Marianne was beatified in 2005 and was canonized in 2012. 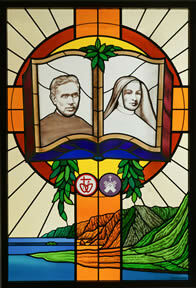 Known as the Heroine of Moloka’i, Mother Marianne was an inspiration to the sisters she worked with, to the patients she cared for and is an inspiration today for the enduring witness of her selfless ministry.